From the moment Louis van Gaal and his Holland charges stunned the reigning champions Spain 5-1 in their first group match, Manchester United will have been salivating at the prospect of the Iron Tulip taking the reins at Old Trafford. However, Red Devil hopes that Van Gaal might be able to drag along a few of his Dutch stars with him to Old Trafford were hit by Arjen Robben’s refusal to entertain the notion that he would swap Munich for Manchester. United are 5/1 to return to the summit of the Premier League under the guidance of their new manager. 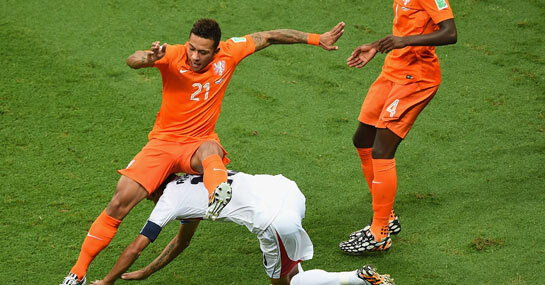 One Dutch World Cup star who would surely be happier to follow Van Gaal to the Premier League is youngster Memphis Depay, who took his excellent PSV form to Brazil, registering two goals and one assist in four World Cup appearances. The 20-year-old enjoyed a stunning season for the Rood-Witten, scoring 12 times and setting up seven, with his electrifying dribbling delighting Eredivisie fans. Depay completed 101 take ons at an average of 3.2 per game, the most in the Dutch top-flight and more than any player bar Eden Hazard managed in the Premier League last season. The youngster also created 2.7 chances per game for PSV, comfortably more than any United player produced, with Juan Mata the most prolific playmaker with 2.2. PSV would likely to be unable to resist the advances of Van Gaal and United if they came in for Depay, and as they have another young star ready to replace him in the shape of 18-year-old Zakaria Bakkali. With Ashley Young, Antonio Valencia and Nani still on the books at Old Trafford, Manchester United’s new manager might have to clear out some deadwood before signing Depay, but the Dutch youngster would have to do little to improve on that uninspiring trio. Adding him to Adnan Januzaj and Wilfried Zaha would give Van Gaal three exciting young flank options to call on as he aims to lift United back onto their perch.